I'm a big fan of the Sketching from the Imagination series of books from 3DTotal Publishing. I wish that this series would never end. 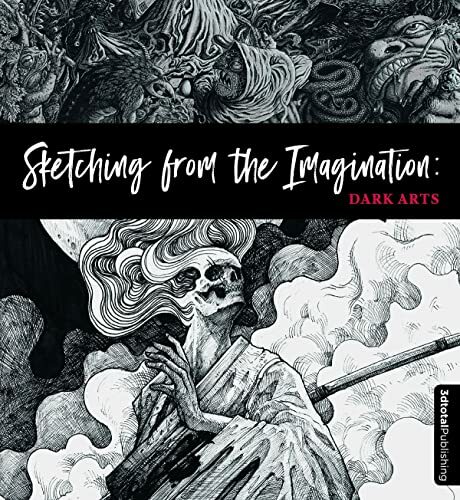 This latest book, once again, features a wonderful amount of beautiful art from awesome artists all around the whole. It's good to see a good amount of female illustrators and artists included. That's something that I should have said in earlier volumes as well. It's good to see diversity and variety. Dark Arts focuses on horror, Gothic and the macabre. Most of the artworks are still somewhat related to characters. There are skeletons, zombies, weird creatures and other forms of dark fantasy. The line art from pen or pencil is a joy to look at. Good art never gets old and this book is definitely one that's worth picking up repeatedly in the future to peruse and enjoy. This applies to other books in the series. This is a fantastic book. Highly recommend to those who love sketchbooks. If you like this book, check out these sketchbooks as well.